I just returned from Paris last night where I worked for two weeks. 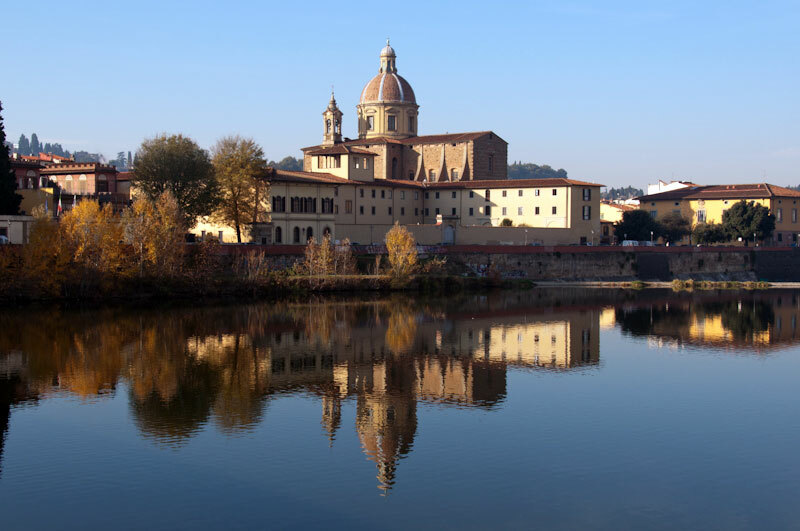 I won�t be returning until January so that I can spend the holidays at home in Florence. This last trip was a time for me to reflect on this last year. It�s remarkable that how the year started and how it ended were so different and unexpected. Back in January, I wrote of learning to go with the flow. At the time, I was talking about the flow of Florence and how the city is always changing. Little did I know that only a few weeks later, I would be embarking on a change that now has me straddling my life between two cities. I�ve been wanting to walk around my beloved city, take in her beauty, and admire the changes she�s going through every day this week. I was only able to do a little of that when I went for my morning runs, but it wasn�t enough. With the sun coming up around 7am and setting around 5pm, the days were short and dense. I was only able to walk around at night and admire the addobbi natalizi (Christmas decorations). I was eager to see the lights hanging across the streets, strung between buildings. I even strolled through Piazza Santa Croce to check out the annual mercato tedesco (German market), but was a little disappointed to find out that the giostra (merry-go-round) didn�t make it here too. This morning at 8am, I was on the Ponte alle Grazie with my marito (husband) waiting for his friends to arrive to run the Maratona di Firenze. An hour before we headed outside, people were already walking through our piazza to get to the starting line at the Lungarno Pecori Geraldi. The weather was certainly on our side: clear, blue skies with no clouds in sight. It was a dream compared to last year when we had heavy rains and cold temperatures. After a great weekend, I was even more excited to go to the questura (police station) in via Zara yesterday morning. After arriving to via Benci and seeing my bus go past me, I walked to Piazza Santa Croce and took a cab. While we rushed through the narrow streets with bicyclists and scooters passing us by at times, I kept thinking about what my new passaporto (passport) will mean for me. Even though I have Italian citizenship, am I as Italian as the other people in the street, my taxi driver, the woman on her bicycle with an empty child seat behind her? My weekend started on Friday night after I got off the last airplane from Paris. To celebrate my return to Florence, my marito (husband) and I went to my favorite pizzeria. When we arrived home, I couldn�t wait to look up at San Miniato while standing at the small wall above the Arno. Besides my fabulous run on Saturday morning, my marito and I went to the stadio (stadium) to watch the Fiorentina play a partita (soccer match). On my first morning back in Florence, I was eager to go for a run to the Ponte all�Indiano at the end of the Parco delle Cascine. The sun was shining brightly over the city without a cloud in the sky. The air was so brisk that I could see my breath in front of me as I began to run. I headed down the lungarno (road along the Arno River) toward the Pone Vecchio. Because I started a little late, people were already out strolling the streets. Twice this week, Tuesday and today, I went for my morning run along the quays in Paris. I have been running in the Champ de Mars around the Eiffel Tower during my stays in Paris, but I did feel like I wanted a change. Each tour of the Champ de Mars is about 2k and a 2-3 tours a few times a week loses its charm. After my long run this last Sunday to Notre Dame, however, I was eager to see what it would be like to run along the quays in the early morning. Seven years ago today, I arrived in Florence and began my blog. At the time, I moved from California with my then husband (now ex). We didn�t really have a plan of how long we�d be staying, but I felt that it would be a long time (as much as forever can be defined in advance). In all this time, I never knew that my life would take a few twists and turns that have brought me to where I am today: married to a new man, straddling life in two different cities, speaking three languages, and being an Italian citizen. This Sunday morning I was excited to go for my weekly long run. When I got outside, the sun was out, the temperatures were mild, and the wind was softly blowing. I mapped out my route and thought that my trip to Notre Dame and back would be 13k, but it was only 11k. For that reason, I had to run one more time around the Eiffel Tower to reach my goal. This morning when I went for my run, the fog was so thick that only half of the Eiffel Tower was visible. Instead of arriving at 7am like I do on a workday, I arrived two hours later. Because it was a holiday in France, I had the whole day to myself, and I was certainly going to enjoy it. When I exited the apartment building, the sky wasn�t its usual dark blue, but rather a light grey. This morning I walked out of the apartment to the Champ de Mars, which is a large public green area in front of the Eiffel Tower. On every trip to Paris, I try to pick apartments near it so I can run in the morning before going to work. It�s also very convenient for me for work too. I only come to Paris once a month for a couple of weeks, but I do love taking the m�tro. All my colleagues think I�m nuts because no one likes the m�tro: it�s smelly, crowded, and dirty. I don�t particularly appreciate those aspects either, but I do like the ability to travel long distances quickly, to have some quiet time to read without being interrupted, and to experience life working in Paris. With the Maratona di Firenze only a few weeks away, more and more people are out running. I�m not participating in the marathon, but I have been wanting to increase my distance and run fewer times a week. Last week, I ran up to the Piazzale Michelangiolo and back. It was about 10k, but this morning I wanted to not only go further, but also change my route again. Yesterday was Festa di Ognissanti (All Saints� Day), but I didn�t go to the chiesa (church) as I had initially planned to say a brief prayer for my parents. On this day, many people visit the cimitero (cemetery) to pay tribute to those who have passed. Since my parents aren�t in a local cimitero, I wanted to go to San Remigio, which is the chiesa where I ordered a messa (mass) for my parents a couple of years ago. By the time I got out of the house yesterday, the chiesa was already closed for lunch. Later in the afternoon, I got busy and didn�t feel like going back.